This week’s theme at CASEing the Catty CTC152 is Painted Autumn/Spooky Nights pages 48-55. You may be starting with me or you’ve hopped over from Rebecca, either way, welcome. There’s lots of great ideas from the design team this week so make sure you check out the full hop. My inspiration for today’s CASE comes from the “Celebrate” card on page 51. I don’t have Pick a Pumpkin bundle so I’ve used Flourish Thinlits instead. I’ve used Pool Party, Wild Wasabi, Sweet Sugarplum and Peekaboo Peach. The Wild Wasabi leaves are from Painted Harvest and punched with the Leaf Punch. I’ve also added some Metallics Sequins. Next up we have Julia. Just click on the next button to hop over to her wonderful project. Would you like to join in on our next CASEing the Catty challenge? Click on the link and send us a request to join. Hello and welcome to CASEing the Catty Sunday Blog Hop. You may be starting with me or you may have hopped over from Julia. Make sure you do the full hop, there’s so much inspiration from my talented crew members. This week we are CASEing the Catalogue Covers and Hostess Sets. I’ve chosen the card with the “Mittens” in the top left hand corner of the Holiday Catalogue. Here is a better look at the card. My CASE of this card uses the Year of Cheer Specialty DSP. My card base is Whisper White Thick card stock. The reindeer is die cut in Champagne Foil Card from Santa’s Sleigh Thinlits and he has a Copper Foil bow. The sentiment is heat embossed in Copper and is from the Merry Patterns stamp set. I hope you like my card today. Next we have Sandra. Just click on the link to hop over and check out her amazing project. Why not join in and enter our CASEing the Catty Challenge? Hello and welcome to my blog. 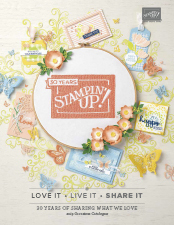 Thanks for joining me and 21 other Stampin’ Up! Demonstrators for a Fancy Fold & 3D Projects Blog Hop featuring fabulous new products from the 2017 Holiday Catalogue. You may have hopped over from the lovely Rebecca Scurr, thanks for continuing on with me. Once you’ve finished on my page click on the next button and hop on to Kristel Rimmer‘s fabulous creations. I knew I wanted to use my favourite DSP, Merry Little Christmas, but I wasn’t sure about which Fancy Fold Technique to use. I decided on a Never Ending Card. They really aren’t that difficult, just a bit time consuming. Here’s a video of my card in action. I watched a great Split Coast Stampers Youtube video on how to make the Never Ending Card then decorated it using Merry Little Christmas DSP and Hometown Greetings Edgelits. I’ve photographed each side of the card so you can have a better look at it. I haven’t made one of these cards for years and I’d forgotten how much fun they are to make. I’ve included a few close up photos of my embellishments. 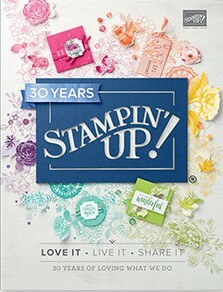 I’ve used the Labels of Love Stamp Set, Everyday Label Punch, Vintage Crochet Trim and Black Rhinestone Jewels. I hope you like my card. Next up on our hop is Kristel Rimmer. Just click on the next button to hop over to her amazing project.